On Nov. 27, I spent an hour on the phone with former Pro Bowl defensive back Dave Duerson. It had been seven years since his mother's death and 364 days since his father's burial, and the following day he would celebrate his 50th birthday. Less than three months later, he sent some text messages to his family and shot himself in the chest. For a time Duerson served as a shining example of the post-career pro athlete. Named the NFL's Man of the Year for his extensive charity work, the Notre Dame grad obtained a certificate from Harvard's Executive Education program, served on his alma mater's board of trustees, and in 2003 started Duerson Foods, his own multi-million dollar meat-processing business. But in November of that year, two days before his 43rd birthday, Duerson's mother died, and his life seemingly changed course. In February 2005 he was charged with domestic assault after pushing his wife during an argument in South Bend — "a three-second snap," he called it — and soon after he relinquished the board seat of the university he loved. Divorce and business failure followed, and this past fall the father of four filed for personal bankruptcy. Nonetheless he was open and forthright during our discussion about his life to that point and the prospect of turning 50, an age he once believed he'd never see. Here he is, in his own words. I have never jumped from a perfectly good aircraft. I had intended to do that for my 40th birthday, and my mom talked me out of it. She had seen video of me bungee jumping, and it messed her up. So that actually was my plan for my 50th, but I'm up here in the D.C. area right now at my fiancée's home, and the weather's not conducive. But I will do it before my 51st birthday. Somewhere over the course of these next 365 days I will definitely jump out of a perfectly good aircraft. I got married at 22, you know, two weeks after I graduated from college. The following week I reported. We had one week for a honeymoon, and I reported to rookie training camp, and then we started a family. But in a lot of respects I was ready. I would've considered myself a very mature 22 year old. My parents were married 59 years when my mother passed, and they were best friends. It was an awesome relationship, so I had an incredible example in that regard. My biggest regret … My wife and I had an argument in South Bend, and, you know, I lost control for three seconds. That was a one-time event. The most disappointing of my entire life, but one that will never ever be repeated. I had some great birthday parties as a little kid, no question about it, but my parents didn't make a particularly big deal out of the birthday itself. Thanksgiving has always been a big holiday for me. Christmas, for me, was always anti-climactic. You know, a lot of folks get caught up in "What have you done for me?" And that's never been my M.O. I'm a giver. I love to give. But part of my problem is, I've never been a good receiver. I've been blessed with so much. I'm not just talking material things. In fact, I'm not even talking material things, really. My life has been so full that for people to make a big deal and give me gifts or whatever has never been my thing — almost to the point where I get uncomfortable. The flip of that is, it's really cool when people do make a fuss about you. At least you know, at least you think, "Well, OK, at least I matter." But I'd rather be showered with love than with gifted items. My 40th birthday was big for me. I gave myself a big party for my 40th. I threw this big party and I had my favorite vocalist, Vesta Williams, come to Chicago from L.A. and do a concert. That's how I celebrated my 40th. My mother passed away seven years ago, November the 26th. Thanksgiving was the 27th, and of course my birthday was the 28th. My dad passed away last year, November the 18th, and we buried him on my 49th birthday. The funeral and burial were on my birthday, which ... that caught me off guard. I've got three siblings. My sister is the oldest. She's 64. I have a brother who's 62. He'll be 63 in January. And a brother who's 52. So when my sister called and told me that my dad's funeral would be on my birthday, her next statement was, "Well, we know you can handle it." There were other days we could've held the funeral, but for whatever reason, my siblings decided, "We'll do this on Dave's birthday." OK, I consider myself strong and all of that. I'd lived the so-called celebrity life, and they considered me the golden child of my family. But, you know, I think they missed the part where I'm a human. And so that was profound. The flip of that is that I played into the plan God had. Every birthday and Thanksgiving, I will also remember saying goodbye to my parents. His last three years, my father started deteriorating pretty fast — he had Alzheimer's and some dementia — so my sister and I made sure everything was handled properly. I was the trustee for the family estate, the executor, what have you, so I was very much involved. Once Dad was in a nursing home I was flying back and forth from Florida regularly, and basically taking care of all of his affairs. Dealing with my father and his health, I was constantly looking at my own life in terms of ensuring that all these various things are taken care of. For instance, my condo is in trust. These are things that I had done before, but that I stepped up again to another level since filing for divorce. I filed for divorce almost four years ago. I want to ensure that things are right for my kids so that, when the time does come, it's straight cookie cutter. I've also told them, on several occasions, "Look, you know I've got these wild eyebrows that I have to trim all the time so I don't look like Einstein." I said, "Don't you guys let me lie up there with my eyebrows all crazy. You know, trim my eyebrows and make sure that the hair's out of my nose. My mustache and my goatee, that's always right, but when it comes to eyebrows, don't let me be up there with a bunch of crazy eyebrows." 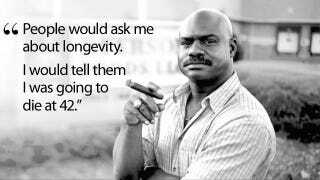 You know, people would ask me about longevity and all that. I would tell them I was going to die at 42. And I don't know what that was about, but, as it turned out, you know, I did suffer the greatest death, from my vantage point, two days before I turned 43. That was the death of my mom, you know, my absolute best friend, my biggest fan. But November 28th of '03, when I turned 43, I did realize I was likely going to make it to old age and so, from a mental perspective, I needed to get ready for things like a slowing gait and losing my step and failed health and all those types of things, whereas I'd always envisioned that I was going to go at the top of my game. I've always pictured my exit at like 75 or 80 miles an hour, and I just happen to, you know, fall asleep at the wheel or something [laughs]. When I turned 43, the first thing I thought was, "Well, I'm still here." But then in that same, small breath, I did experience a death, my mom's. A lot of redefining took place. And to a large extent, leading up to that February 2nd in '05 when I had my three seconds where I lost control, that was a large part of it. I was in the midst of mourning my mom at that point. I hadn't had the chance to mourn her before, because I was the one who had to tell the doctor to pull the meds. Dad just couldn't do it. And so it fell to me, and I'm the youngest child. So here I am. I'm telling the doctor, "It's time to pull the meds." It was my voice that actually said, "OK, we're now making a definitive motion that, not only is death imminent, but we're executing on it." So a lot of that, you know, all of that came into play as I had my 43rd birthday, and I went through that year, and then the year that followed, just … You know, I'd lost my best friend. I'd lost my support system. I do hold myself to a higher standard. I do. But the flip of that is, every one of us has things in their life they regret. For instance, I'm a Trekkie. And it wasn't the series so much as the movies, the Star Trek movies. I remember a scene from one of the latter ones with William Shatner. This guy, Spock's cousin or his brother, he could hug you and take away your pain. And he says, "Come join with me, and let me take away your pain." And Dr. McCoy and everybody else is like, "Jim, you've got to do this. It's wonderful." And Captain Kirk tells him, "I need my pain, because it defines who I am." And so in that regard when people come up to me and they tell me, "Man, I wish I were you," I tell them in the same breath that in order to be me, you have to accept my pain. My father worked for General Motors for 38 years, and Muncie, Indiana, where I was born and raised, is where all the transmissions for American automobiles were made. And there were these family days and what have you when we'd go out to the plant with my dad. From the time I was 3 years old, I wanted to own my own manufacturing business. Now, that's not because I'm so brilliant that I began to think in terms of ownership at 3. But I would point to those 600- and 900-pound presses and tell my father, "I want to do that. I want to do that." And my dad said, "No, son. You want to own that." So, growing up and through my adolescence, I would go out to the plant with my dad, and I was still showing that same type of excitement for the factory and the equipment and the moving parts. He always talked to me in terms of preparing to own. That started from the time I was 3 years old, and that was my plan, as I said, all the way through high school and college. I had never planned on playing football professionally. That was never a dream of mine. In the NFL, I was ostracized from Day One — not by my teammates but by my defensive coordinator. I was drafted by the Bears in 1983. My first day walking into Halas Hall, I met Buddy Ryan. He knew I'd gone to Notre Dame, and he asked me if I was one of those doctors or lawyers. I said, "Yes, sir." He said, "Well, you won't be here too long, because I don't like smart niggers." I worked for Buddy for three years, and there was not a day that he did not remind me that I was not his draft pick, that he did not want me there or something to that effect: "You won't be here too long because I'm trying my best to get you out of here." That kind of thing. And so it was a very lonely feeling in that regard. It was not motivational at all. The guy simply hated my guts, without question. He came as close to apologizing to me as he could a couple years ago when we saw each other at one of these card-signing events in Chicago. Of course, I would always go right up to him and extend my hand and say, "Hello," and I did, and this time he said, "Dave ..." He never called me Dave. He would call me 22, or he would belt out my nickname. My nickname is "Double D," so he would call me "W D" or something like that. The closest he would come to calling me by my name was when he'd say, "W D." And then, two years ago, he said, "Dave." And he said, "This time can I have a hug?" And that was his way of saying, "I'm sorry." A couple of years ago I would've described myself as a perfectionist. I would have. But I was watching Jay Leno one night — I've never been big on the late-night TV stuff, but Jim Carrey was on, and Jay was talking to Jim about how awesome he was and about perfecting his roles and what have you, so he says, "You get into a part and you live the part and you are an absolute perfectionist." And Jim Carrey says, "Perfection is God's business. I just try for excellence." And I have to tell you, I dropped in front of the TV, man. I dropped to my knees in front of the TV and said, "Look, I'm sorry. Forgive me for my arrogance." Rob Trucks's interview with Dave Duerson is part of an ongoing oral history project with Americans turning 50, including the Flaming Lips' Wayne Coyne, Vanderbilt University basketball coach Kevin Stallings, Wisconsin State Sen. Jon Erpenbach (one of the "Fighting 14"), and Olympic gold medalist Benita Fitzgerald Mosley. Trucks's last Deadspin post was about the late Alex Chilton's time in Tuscaloosa, Ala., and his latest book, on Fleetwood Mac's Tusk album for Continuum's 33 1/3 series, is available through Amazon and better bookstores everywhere. Email him at tusktusktusk@gmail.com. Top photo by the Chicago Tribune's Charles Cherney.